The episode starts with raja devodas praying to the shiv ling, he says prabhu forgive me for what I did, I separated you and mata adishakti. Please forgive me prabhu and come back to kashi, come back, mata is waiting for you, mahadev opens his eyes and gets up. Brahma dev and all gods walk with mahadev towards kashi. Mahadev lands in kashi with all gods and brahma dev. All baba’s start dancing to welcome mahadev and play damru and do his pooja. All of kashi, lights and dances with happiness as mahadev walks in kashi. Everyone say har har mahadev. Mahadev walks in the temple of adishakti and she finally gets up as she sees him. she goes to mahadev and they look at each other happily. Mahadev says my bhakt, rishi jageshvi is waiting for me. adishakti says yes. Mahadev goes to rishi jageshvi as he prays to mahadev. Rishi opens his eyes as he is weak. Mahadev stands in front of him. rishi finally sees mahadev and cries, he says mahadev and tries to get up and trips, kartikeya goes to help. Mahadev holds rishi as rishi says mahadev my prabhu, kartikeya and pratham pujya ganesh ji gave me the strength to stay alive and because of belief in you, I could live to see you and get your darshan. Kartikeya and ganesh help rishi. Rishi says you have given me darshan, and now I can die peacefully and go to parlok. Mahadev says no rishi, you said you would eat only after I gave you darshan, so you will eat. Mahadev and all gods pray to temple of mata Annapurna and say give food mata. Adishakti’s Annapurna form comes with food and butter and mahadev says devi Annapurna, I ask for some food. Annapurna gives food in an earthen bowl. Everyone pray to mata. Mahadev feeds the food to rishi jageshvi from his own hands. Rishi eats and he turns fine and back strong as he was. Rishi is happy and gets up, he says mahadev! And he falls at mahadev’s legs and prays and says thank you. rishi takes the blessing of devi Annapurna. Mahadev says devi Annapurna, you are a helper of the needy and for all that you do, being the Annapurna, in my kashi your temple shall be made and all my disciples and your disciples shall come here, from which you can give them food. Mahadev uses his powers and creates a temple of mata Annapurna. Everyone does har har mahadev. In kashi, everyone does pooja and dances saying har har mahadev. All the million rishi’s dance and bells and instruments are played. Mahadev says ganesh, because of your hard work, kashi has become lively again and I could come back to my beautiful kashi. Kartikeya says yes, mata always guided us for everything. Mahadev says ganesh, how do I thank you for what you did? My maheshwari had been waiting here for years, but son you found a way for me to kashi finally. Ganesh says you and mother were so in pain, how could I see that? so I did what a son’s duty is to do. Mahadev blesses ganesh. Ganesh hugs mahadev. Mahadev says Herambh! The universe hears it. Mahadev says you shall be known as Herambh too, herambh means the one who helps needy and helpless people and those who need help, finds the solution to their problems, which means that kind god who shows his disciple a light of hope and is the protector of all beings. Mahadev says ganesh, now I announce that a divya temple of yours shall be made! You guided maharaj devodas and gave him moksh and you also helped me and your mother and helped rishi jageshvi and thus helped the entire world. Mahadev says ganesh, you saved and helped my disciples and you protected everyone and the entire world as a whole, so this shall be the importance of your Herambh form. your herambh form shall be very beautiful, divya and holy, known as herambh ganpati! Ganesh takes the herambh avatar, sitting on a lion and has 5 heads in all. 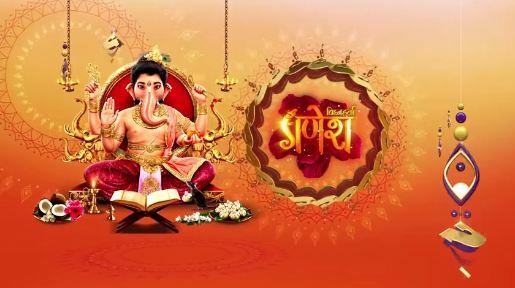 Everyone does pranam to herambh form of ganesh. Precap: Adishakti says I shall kill durgamasura! But this is possible when devi of ved shall be brought safe and that work has to be done by you ganesh.